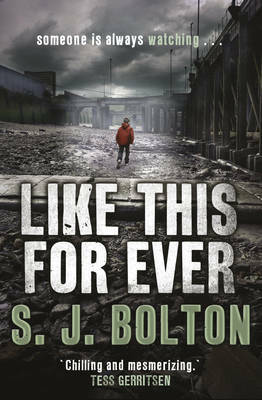 This is the sixth book by S J Bolton, and her third police procedural featuring DIs Dana Tulloch and Mark Joesbury, both part of Lewisham's major investigation team, and Lacey Flint, who is currently on sick leave after a particularly nasty case she was involved in in Cambridge, in the previous book, DEAD SCARED. LIKE THIS, FOR EVER centres around the bizarre killing of young boys, who are found with their throats cut, but otherwise appear unharmed. In the latest development, twin boys Jason and Joshua Barlow, are found on the 'beach' by the side of the River Thames near London Bridge. Killed elsewhere, and somehow the bodies dumped without anyone seeing anything. The numbers of murdered boys has swiftly risen to five over a few weeks, although the body of the first boy to go missing has not yet been found. The shortening length of time between the attacks means strong pressure from the press and the public to find the culprit as quickly as possible, although there are precious few clues to go on. Meanwhile, Lacey is trying to pull herself together, but inevitably gets drawn into the case through her connection to Mark (a long-running love story, that never somehow goes anywhere) and through her relationship with a ten-year-old boy Barney, who lives close by. Barney is a troubled soul, living with his dad (a university lecturer), and secretly searching for his missing mother. Is she still alive somewhere? What happened to her and why doesn't she get in touch? He is fascinated by the missing boys, and keeps a collection of articles about them on the wall of his den (hidden by a large astronomy poster). He realises that the boys are all taken either on a Tuesday or a Thursday, co-incidentally the two nights that his father works late, but also the two nights when football practice takes place at his local school. He also follows a Facebook page dedicated to the missing boys. Worryingly, an anonymous commenter on the site seems to know what's going on even before the police. Is this the killer, or a hoaxer? Details about the mode of death are leaked, and suggestions made that the killer is killing the boys so he can drink their blood, driving a media frenzy. Then Barney and his friends discover the fifth body, in the river close to his dad's boat. They text Lacey to tell her, and suspicion starts to mount that Barney's dad may be involved. I normally enjoy S J Bolton's books, but I have very mixed feelings about this one. I couldn't quite believe that an intelligent, university lecturer would leave his ten-year-old son on his own in a big house, late into the evening, when the son is clearly so worried and obsessed about the missing boys. I found the references to drinking blood somewhat laughable, and wasn't really sure how bringing this angle into the plot helped the story. I was completely frustrated by the Lacey character, and her continued mix of strength and complete abjectness. And I found the final plot twist highly unconvincing, with Joesbury yet again coming to the rescue. It's such a shame really, as the Lacey character and the rest of the police team could make a highly convincing, dedicated investigative team. They each have interesting characters, but there are so many tensions and unresolved emotions between each of them it is hard to believe that they would ever work together effectively to solve anything at all. Next time, a more realistic crime please, and let's make Lacey finally pull herself together! Read another review of LIKE THIS, FOR EVER.